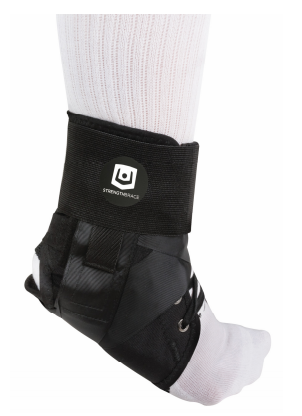 Ideal for after cast removal or moderate sprains, the StrengthBrace Canvas Lace-Up Ankle Brace fits either the left or right foot and is available in multiple sizes. The lace-up enclosure provides a secure medial and lateral fit, while the unique figure-8 strapping provides extra support and stability. Designed for those with chronic ankle instability, sub-acute ankle, and ankle injury rehabilitation.